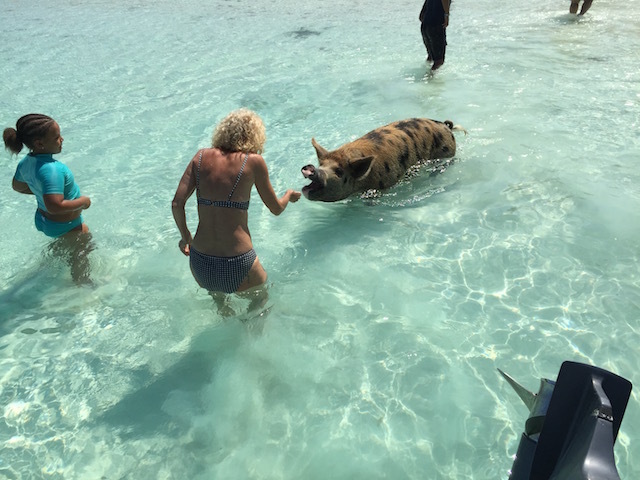 A trip to the Exuma Cays – swimming with the pigs ! 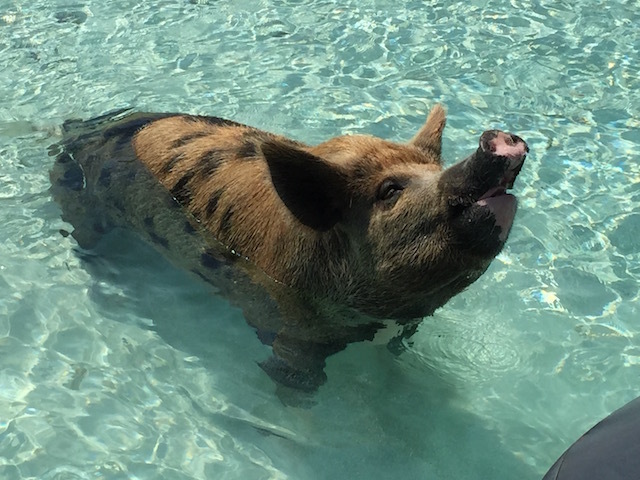 It is not often enough that Bob and I take a trip around the Bahamas – but this week we did – we took a trip to the Exuma Cays and went swimming with the pigs ! We have heard about it from various sources and so when our good friends Tommy and Natasha Sands from Rock Sound asked us to go along on a trip with them we jumped at the chance. We went on a boat with Captain Cally out of Davis Harbour – including the crew there were 12 of us all together. 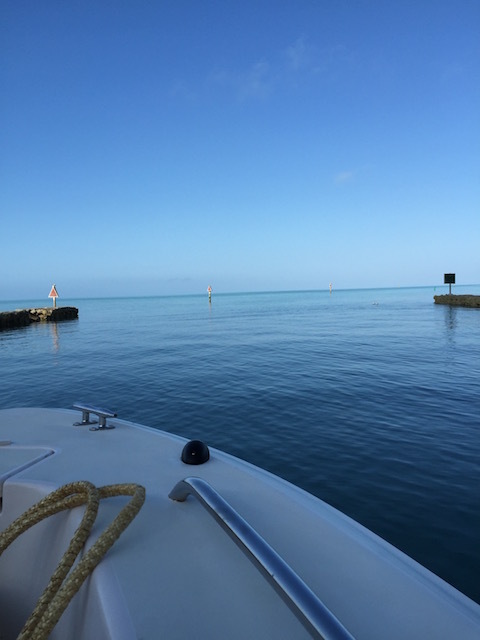 The day was just perfect – clear blue sky and the sea was as calm as it could be so we made good time and reached the Exumas in an hour and forty minutes. Apparently it can take up to two and half hours depending on the weather conditions, so we were lucky…. Do you think I look a little nervous ???? 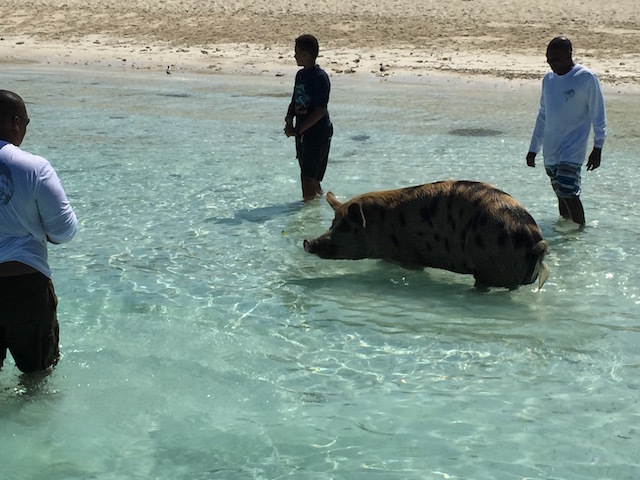 We swam in the crystal clear water and then all got back on board to go to nearby Staniel Cay for lunch. Staniel Cay Yacht Club was a big surprise. The amount of boats of all sizes was fantastic. 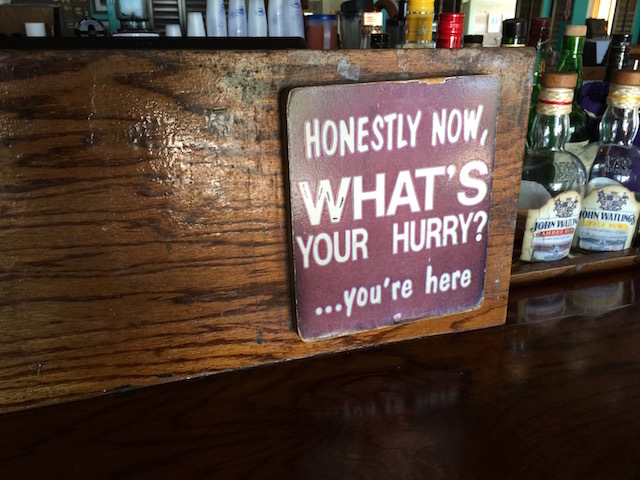 There is a good sized restaurant and bar which is where we ate lunch. We pre-ordered as there were 12 of us so there was no long wait. I had grilled shrimps followed by lobster salad – both were delicious. It is not the most exotic menu – but everything is well done and the service was good. The place was packed – there was a great atmosphere and everyone was having a great time. 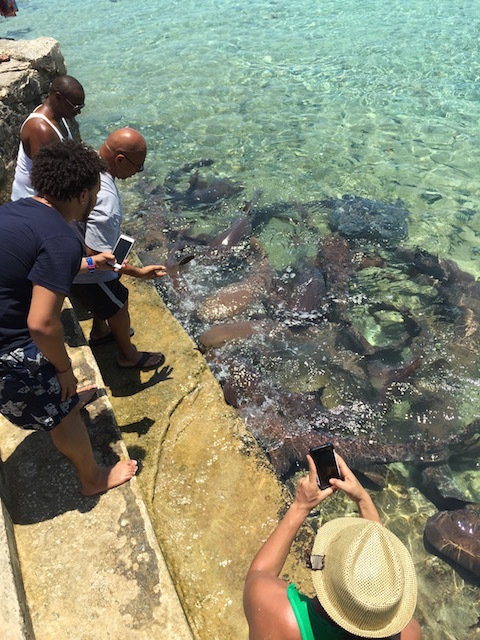 In the harbour there were lots of nurse sharks. They come up to the steps and are obviously fed regularly and seem quite tame. Some people did go in the water with them but this did make them dissipate a bit. 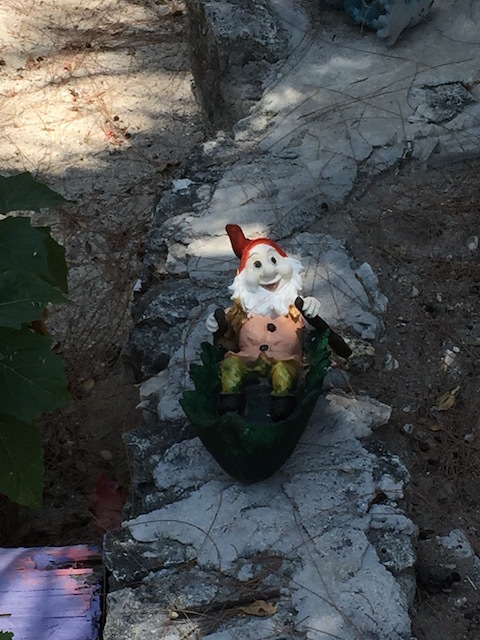 After a short walk around Staniel Cay we were ready to take to the water again. More swimming at another deserted beach then we headed for Davis Harbour again. 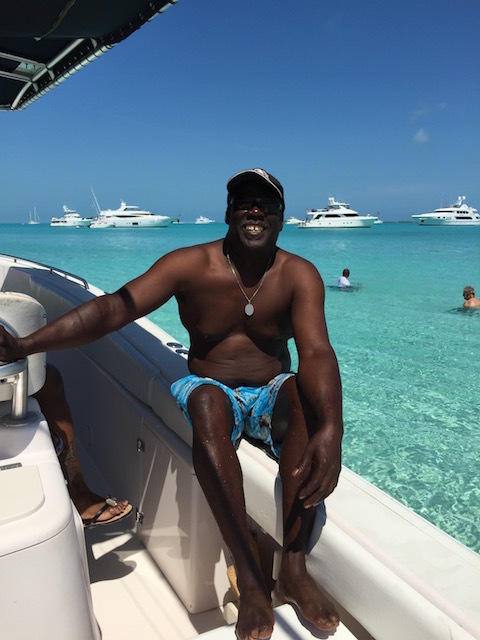 Many thanks to Captain Cally for a fabulous trip – he is always happy and smiling and his crew as well made it a most enjoyable day…..
Captain Calvin Jolly’s details are – his boat is a 30ft Grady White and he operates out of Davis Harbour. His cell phone number is – 242 557 7948 or 242 470 3744 His home number is 242 334 0016. Call him to get a price for a similar trip……. 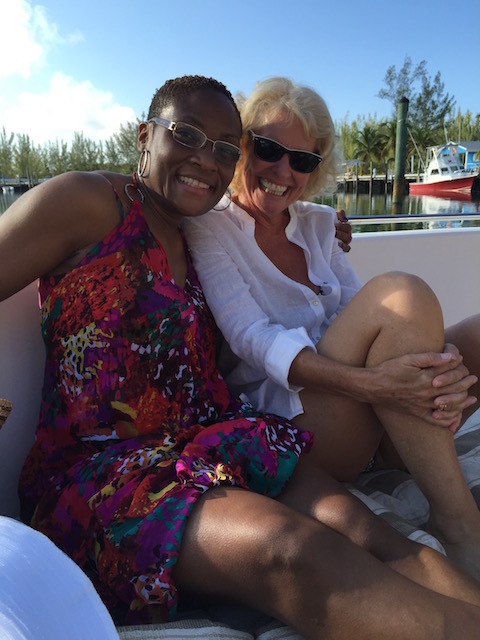 On being a competition judge in Eleuthera…..
What a cool day trip! Those pigs pack a lot of weight. Looks like Stu and I have to trip down there. Yes it was a great day out ….. i did get a bit braver later on – but as you say they are big chaps !! !